Relatively few people have heard of the Home Guard ‘Auxiliary Units’ of World War II. Formed in 1940 they were to be the British Resistance, countering a German invasion by delivering guerrilla warfare tactics throughout their localized areas. Stewart started researching the Sussex Auxiliary Units in 1992. Four years later, following extensive interviews with original patrol members and many hours in the field looking for the remains of their secret hideouts, his findings were published as ‘The Secret Sussex Resistance’ The presentation will highlight his research findings and how strategically placed Lewes would have been had a German invasion taken place. 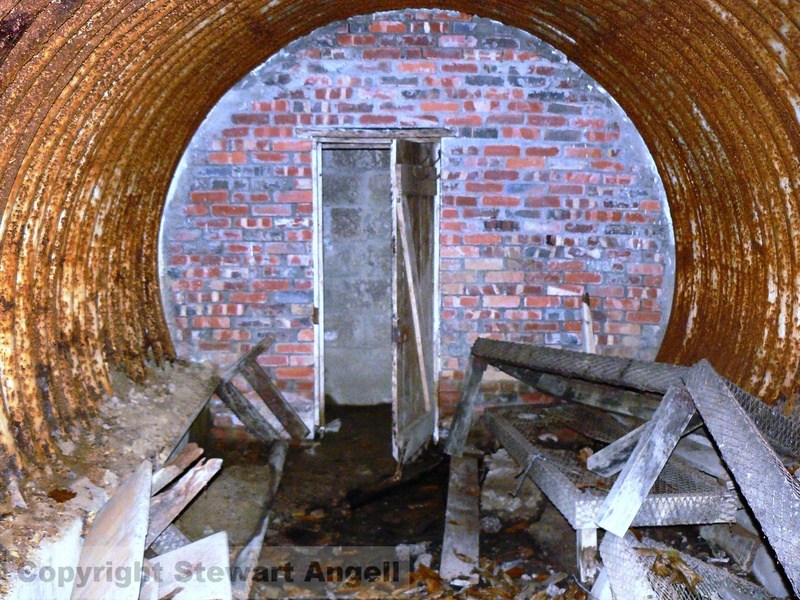 Stewart is a founder member of the Sussex Military History Society, a member of the Council for British Archaeology South-East and a long-time member the underground exploration group Subterranea Britannica. For my own purposes I have put together a series of working indexes for the Bulletin, the main ones being Lewes people and places mentioned and the topics covered. These are ‘living documents’, continually being updated, and typically a little behind, so the most recent Bulletins may not be included. My working format does not readily lend itself to online publication, but if you would like to know whether the Bulletins make any reference to a person, place or topic near to your heart, please do email me at the address at the end of the Bulletin. While the indexes are not perfect (especially the topics index), this is probably a lot quicker and easier than ploughing through the nearly 70 issues of the Bulletin now online. Source: ESRO P410/2, which includes a photograph of each mayor. The following list encompasses the 40 men and 2 women who served as Mayor of Lewes during the period of the Borough of Lewes. The dates below are the years of election – the mayoral year started in the Spring. Most mayors served for 1-3 years. The longest tenure was that of Charles Doland Crisp, who served for 11 years in three periods, while George Holman served 7 years in two periods. The shorest tenure was that of Kenneth Charles Day, who served for only 2 months in 1968. The first woman was Anne Dumbrell, chosen in 1963. Many of the names will be familiar. Mounted troops of Dragoons were regularly rotated around army bases at home and abroad. In 18th century Sussex they were a key resource used to combat smuggling. After the 1893 death of Lewes banker George Molineux, a partner in the Old Bank for more than 40 years, his properties in Lewes, Isfield, Ringmer & Barcombe Mills were put up for sale by auction. As befits a man whose career had included railway promotion, the advertisement featured their proximity to the railway stations at Lewes, Barcombe Mills and Isfield. Also sold in Lewes were another 10½ acres of ‘accommodation brookland’ nearby, adjacent to the Convent Garden and Priory Ruins, and a delightful villa residence known as ‘Woodbine Villa’ in Spences Field, Southmalling, in the occupation of Mr C.J. Berry. George Molineux had purchased the Dripping Pan, Mount Field and Convent Field in 1878. 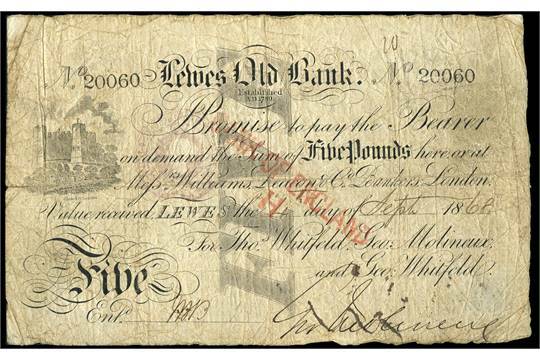 This £5 banknote was issued in September 1868 by the Lewes Old Bank whose partners were then Thomas Whitfeld, George Molineux and George Whitfeld. It carries the signature of George Molineux and is valued at £400-£500. An 1882 £5 banknote issued by the same bank, with the partners George Molineux, George Whitfeld, Philip H. Molineux and Francis Barry Whitfeld was sold by Bonhams for £1,292. If you have one lurking in a drawer look after it! “Lewes Officer’s Death: Popular Motor Engineer. Lieutenant H. Newham, RASC, is reported to have died of wounds received on active service in the Middle East, at the age of 42. The Depot, a new independent cinema, will open in Lewes in early 2017. While waiting for it to be built, a group of local film makers and others interested in local history have formed Reel Lewes, to investigate and celebrate cinema-going of the past in Lewes. We will make a film and gather interviews and resources for an exhibition, ready for the Depot opening. We need your help. Do you remember going to the cinema in Lewes? Did you go to the Cinema de Luxe on School Hill? Do you remember Fatty Briggs or Ice Cream Lil with the flit gun? Or did you go the Odeon? Do you remember the ushers, usherettes and their uniforms? Did you go to children’s’ Saturday screenings or rehearse for shows in the foyer? Did you ever watch a film during an air-raid? This entry was posted in Cultural History, Economic History, Lewes, Local History, Military History, Political History. Bookmark the permalink.